So last Friday, something awesome happened. I got two copies of the actual, final, real life version of The Selection. I woke up from a nap and there they were! I made Callaway film me, but because I was so drowsy from waking up… I just… I can’t even tell you how awkward it is. So, instead, here are some pictures of the final product, which you will be able to snuggle with in 3 weeks! This is the book in its hard bound glory. Even though I've had the dust jackets forever, seeing it wrapped around an actual book is crazy! There's no ARC stampy thingy on the side. I'm in love! This is what is waiting just under the cover. Isn't it lovely? It looks like a diary to me, which I'm totally nuts about. Perfection! And, finally, this might be my favorite thing. 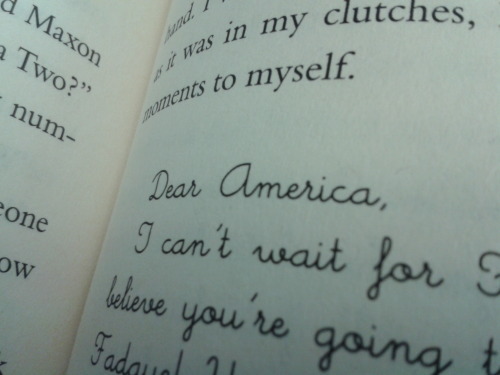 Maxon, America, and May all write notes at different parts in the story. They each have their own handwriting now, and they're so perfect. I couldn't have picked them out better myself. After all this time, I can't believe it's right around the corner! I hope you guys love it!